Two years ago I was fortunate to be invited to be a plenuary speaker at the first annual Marine Ornamentals Conference in Kona, Hawaii (the second was held last fall in Orlando, Florida). 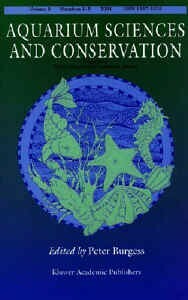 In March of 2001 the proceedings of that conference were published in volume three of Aquarium Sciences and Conservation, edited by Peter Burgess and published by Kluwer Academic Publishers (www.kluweronline.nl). This conference marked the first time that all stakeholders in the marine ornamental industry were brought together in one setting. Over 300 collectors, exporters, importers, retailers, aquaculturists, hobbyists and scientists from over 20 countries gathered for four days of 70 papers, discussion panels, workshops and eighteen invited plenary presentations. The papers presented in this issue were chosen from numerous invited and contributed papers. Governments should develop better communication with the marine ornamental industry on their resource concerns and pending regulatory actions. Encourage the development of a simplified text on the principles of tropical fisheries biology and management, with emphasis on marine ornamental species, to help educate the public on the basis for regulating development and use of marine resources. Investigate mechanisms for the scientific community and the marine ornamentals industry to collaborate on research, in order to accelerate scientific progress. International and federal research funding sources should give highestpriority to projects involving the advancement of marine ornamental aquaculture and reef preservation and this recommendation should be forwarded to all appropriate organizations. The marine ornamentals industry should develop product-handling programs and research projects aimed at reducing and minimizing handling stress and its affects on survivorship. Develop a comprehensive process, through the Marine Aquarium Council, that involves the full range of stakeholders and focuses on constructive efforts to resolve national and international issues affecting the marine ornamentals industry. Develop marine ornamental industry standards and certification requirements with the broad input of the full range of stakeholders. Rapidly develop and implement industry-wide certification programs for the marine ornamental trade. Encourage through the use of market-based incentives or legislation, aprocess that rewards and/or acknowledges those industry members who provide a product that meets accepted best practice standards. Develop reliable trade and biological data for marine ornamentals. Develop mechanisms to identify and respond to misinformation and disinformation about the marine ornamentals industry. A conference along the lines of the Marine Ornamentals ’99 concept should be held at regular intervals and no less than every two years. Develop and publish a directory of all individuals and firms involved in the marine ornamentals industry to assist in communication. The entire marine ornamentals industry should adopt and employ ethical methods for sustainable use of bio-resources in the 21st century. The marine ornamentals industry must adopt and utilize sustainable, environmentally friendly collection methods. The marine ornamentals industry should accept and endorse sustainable collection and sustainable cultured sources and adopt a policy of expanding the market for both sources. Education programs and collector organizing efforts should be “holistic” in approach and include consideration of environmental, economic, social and cultural issues, not just technical issues. The industry should encourage the notion that aquacultured animals and plants are bred to be better adapted to the aquarium environment and therefore have higher value. The marine ornamentals industry must develop greater consumer demand for fish aquacultured and/or collected in a sustainable manner. The marine aquarium industry should adopt a pro-environment and pro-habitat position with respect to the global pollution and destruction of the natural environment that is occurring today. The U.S. wholesale market for marine ornamentals. Volume and value of marine ornamentals collected in Florida, 1990-98. Cyanide-free net-caught fish for the marine aquarium trade. Structure and management issues of the emerging ornamental fish trade in Eritrea. Global advances in conservation and management of marine ornamental resources. Tracking the trade in ornamental coral reef organisms: The importance of CITES and its limitations. Artificial reefs, the attraction-production issue, density dependence in marine ornamental fishes. The potential for the restoration of marine ornamental fish populations through hatchery releases. Territorial use rights in fisheries to manage areas for farming coral reef fish and invertebrates for the aquarium trade. Essential fish habitat and the effective design of marine reserves: Application for marine ornamental fishes. Ornamental reef fish aquaculture and collection in Hawaii. Coral farming: Past, present and future trends. Nubbing of coral colonies: A novel approach for the development of inland broodstocks. Application of marine food fish techniques in marine ornamental aquaculture: Reproduction and larval first feeding. Effects of varying dietary fatty acid composition on growth and survival of seahorse, Hippocampus sp. juveniles. Feeding electivity indices in surgeonfish (Acanthuridae) of the Florida Keys. Growing giant clam ( Tridacna derasa ) in aquaculture effluent. Biosecurity and genetic improvement of panaeid shrimp: Applications to the marine ornamental industry. This issue would be of value to anyone who has an interest in ethical and sustainable trade practices as well as giving a glimpse into the industry and the prevailing attitudes therein. A second publication was just released this March. 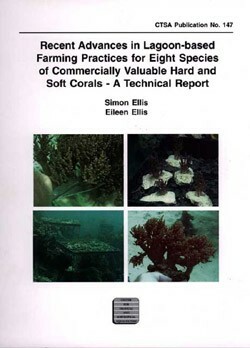 Recent Advances in Lagoon- based Farming Practices for Eight Species of Commercially Valuable Hard and Soft corals – A technical Report by Simon and Eileen Ellis is publication number 147 from the Center for Tropical and Subtropical Aquaculture (CTSA). It and it’s companion publication, The Culture of Soft Corals (Order:Alcyonacea) for the Marine Aquarium Trade (CTSA #137) are available from the CTSA at The Oceanic Institute, 41-202 Kalanaianaole Highway, Waimanolo, HI, 96795, USA and at http://library.kcc.hawaii.edu/CTSA/publications/index.html. Both these manuals give detailed advice and instructions on how to start a coral farm, which corals to choose, and how to fragment and ship them. The second publication details a study done on the suitability of four species of hard coral and four species of soft corals for aquaculture. Chapter headings are:site selection, advances in farm structure, culture techniques, growout and husbandry, diseases and pests, harvest and transport, shipping, industry feedback, a revised economic model for coral farming in Pohnpei using recommendations from this study, species summaries and a reference section. The following are citations for articles that might also be of interest to aquarists, which were published in the latter months of 2001 and early 2002. Bates, N.D. 2002. Seasonal variability of the effect of coral reefs on seawater CO2 and in-sea CO2 exchange. Limnology and Oceanography 47(1):43-52. D.B. Carlon. 2002. Production and supply of larvae as determinants of zonation in a breeding tropical coral. J. Exp. Mar. Biol. Ecol. 268(1):33-46. Elfwing, T., Plantman, P., M. Tedengran and E. Wijubladh. 2001. Responses to temperature, heavy metal and sediment stress by the giant clam Tridacna squamosa. Marine and Freshwater Behaviour and Physiology 34(4): 232-248. Gorbunov, M.Y. and P.G. Falkowski. 2002. Photoreceptors in cnidarian hosts allow symbiotic corals to sense blue light. Limnology and Oceanography 47(1):309-315. Hart, A.M., Lasi, F.E. and E.P. Glenn. 2002. SLODS’ : Slow dissolving standards for water flow measurements. Aquacultural Engineering 25(4):239-252. Krabs, G., Bischof, K., Hanell, D., Karsten, U. and C. Wiencke. 2002. Wavelength-dependant induction of UV absorbing mycosporine-like amino acids in the red alga Chondrus crispus under natural solar irradiation. J. Exp. Mar. Biol. Ecol. 268(1): 69-82. Litchman, E., Neale, P.J. and A.T. Banaszak. 2002. Increased sensitivity to ultraviolet radiation in nitrogen-limited dinoflagellates: Photoprotection and repair. Limnology and Oceanography 47(1):86-94. Trepanier, C., Parent, S., Comeau, Y. and J. Bouvrette. 2002. Phosphorous budget as a water quality management tool for closed aquatic mesocosms. Water Research 36(4):1007-1017. Valenzuela-Espinoza, E., Millan Nunez, R. and F. Nunez Cebrero. 2002. Protein, carbohydrate, lipid and chlorophyll a content in Isochrysis aff. galbana (clone T-Iso) cultured with a low cost alternative to f/2 medium. Aquacultural Engineering 25(4):207-216. Yabuta, S. 2002. Uncertainty in partner recognition and the tail-up display in a monogamous butterflyfish. Animal Behaviour 63(1):165-174.